Inder Loves Folk Art: City! Joe will be two and a half next week, and he is now well into the age of symbolic pretend play. This is really fun. And, at times, a little surreal. For example, Joe has decided that my cheap brown leather belt with gold studs is a "snake." A snake that likes to slither all over the house, through the "cities" that Joe builds with his blocks, and occasionally knock buildings down with its gold buckle head. "Mama! Snake boom crash city!" "Oh, the snake knocked over your city and made it go boom, Joe?" "Snake. City. Big tower! Boom crash!" You'd think the idea of a giant snake that takes down whole cities would be terrifying to a small child, right? Think again: Joe is the power behind the scary snake. It's all about agency, folks. So, needless to say, when I tried to put the "snake" on and wear the "snake" to work over a cute tunic last week, all hell broke loose. I gave in, of course. It was clear to me that the snake's value to Joe as a prop for imaginative play far exceeds its value as an accessory. Simple parental math. Since Joe is speech-delayed, this recent intensification of symbolic play is more than just amusing and fun (and surreal, what with the cities and towers and leather snakes). 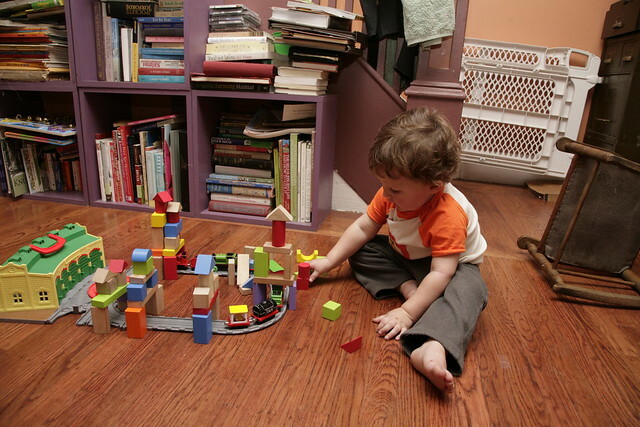 There is scientific evidence that symbolic play is closely linked with language development in children, and the two usually develop side-by-side (with late talking children engaging in pretend play later than other children). It has something to do with the way the brain learns to process symbols: children seem to learn symbolic play around the same time that they start learning symbolic language. I will say this for having a speech-delayed child: It has made me so much more aware and appreciative of the processes by which we learn language. Basically, human brains are complex and amazing. Joe's speech is still behind that of his peers, but he is learning so quickly, it's hard to feel too worried about him these days. His vocabulary is so big I lost track of his "word list" months ago. Joe's vocabulary now includes loads of nouns ("tower" "city" "train" "tracks"), a good number of useful verbs ("go" "fly" "walk" "sleep"), lots of adjectives ("wet" "yellow" "big"), and a few comic book exclamations ("boom" "crash" "whoa") for emphasis. He says "shoot!" when he's upset, with disturbing clarity (yes, could be worse). And sure enough, with this larger vocabulary comes a greater imaginative world, where trains and snakes travel through cities of blocks, with "tall towers" and "big tunnels." It's hard to know which came first, the talking or the play - just like the scholarly articles say, I think they are developing side by side. "Mama, snake boom! Fix big tunnel! Fix city!" This is such a sweet post. 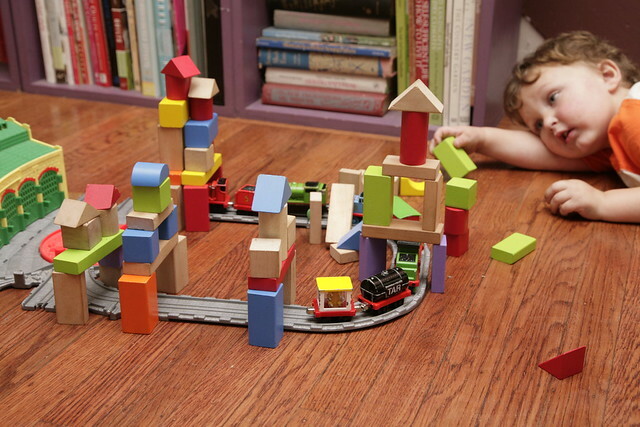 We also build towers around our train tracks and it is so super fun. It was really interesting reading about your son's speech development. I would love to know more about how you became aware that he was a bit behind in the first place. I blogged a bit about it back in the day - http://inderlovesfolkart.blogspot.com/2011/06/words.html - but I'm also happy to answer any questions! These are great photos... Joe is incredibly adorable, but I'm not telling you anything you don't already know! As we are becoming more aware of speech concerns I really am interested in learning about Joe's progress. It sounds like he's really coming along! I think you're right not to feel too worried. Kids develop on their own individual timetable. You aren't ignoring the issue and he is getting support. I'd be quite surprised if he didn't turn out just fine in the speech department. 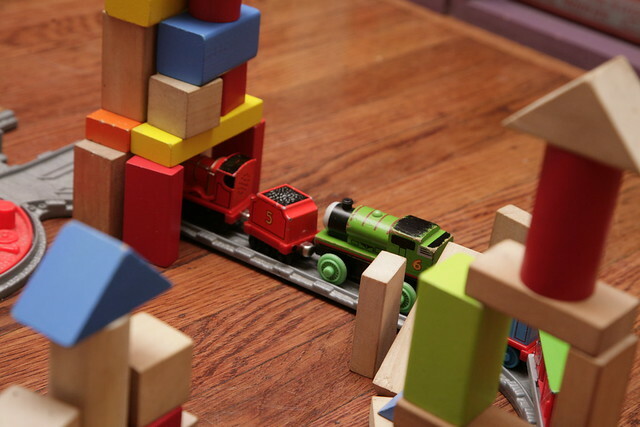 The development of imaginitive play is just magical isn't it! So glad the talking is clearly coming along in leaps and bounds. I think you should buy yourself a new belt to celebrate! Folkhaven & Jane: His speech is definitely coming along, which has in turn really helped me to stop worrying quite so incessantly! I mean, I know moms worry, but I'm happy to worry a bit less, whew! Mojo: As a land use lawyer, I hear "accessible" and all I can think is "ADA compliant" which I don't think this city is! However, agreed, it has a mixed-use vibe, it is very pedestrian friendly, and provides excellent public transit. The shape sorting top to that bucket makes them fun for kids to put away. Seriously, this is one of the only toys that Joe will really help put away. 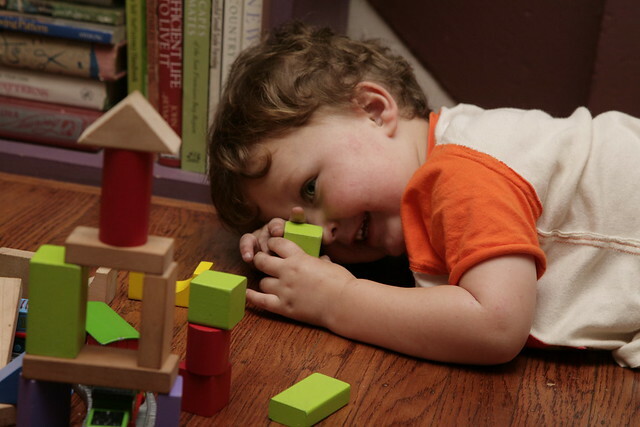 My oldest son didn't start speaking more than a few words until he was two and a half. I had him referred for speech therapy and they gave me some really useful tips but by the time his appointment came around months later he was talking in full sentences. He is now a lot easier to understand than many children his age. It sounds like Joe's speech is coming on well now anyway (and this post is from a few months ago) but the tips included offering a choice, so "do you want an apple or a banana?" instead of just "do you want an apple?" and then saying lots of different things about the apple until you sound a bit crazy, "you want to eat an apple, this big green apple, this lovely juicy apple, etc". Hi Laura! Yeah, Joe is talking a lot more now, and there are lots of exciting new developments (like counting!) but he does not speak in "complete sentences" yet (he rarely uses pronouns or articles, for example) and he is still quite difficult to understand. So he'll probably be in speech therapy for a while yet. Hopefully, like your son, this will set him up for great diction for life! I've been meaning to post an update on his speech progress - soon! Believe me, we know and use all the tricks! Speech therapy has definitely helped Joe, but not nearly as much as it has helped my husband and I learn to work with Joe in his everyday life. I love comments! I do my very best to respond to comments, by email or here, although I am often running late. I also try to follow and comment on my regular readers' blogs. So please let me know you were here! I live in a creaky old Victorian house in Oakland, CA with my awesome husband Steve, five year old Joe, two year old Maggie, and brother Harpal. A local government attorney by day, this blog follows my explorations in parenting, sewing, and my many hobbies. Some of my favorite blogs. KCWC Day 7 - Prairie Blouse. KCWC Days 4-6: Sailboat Top. KCWC Day 3: Cord Pants!